Although the term Art Deco was coined in 1968, it refers to an aesthetic in vogue between 1909 and 1939, adopted in the decorative arts, textiles, and fashion. This avant-garde style was synonymous with sophisticated modernism. 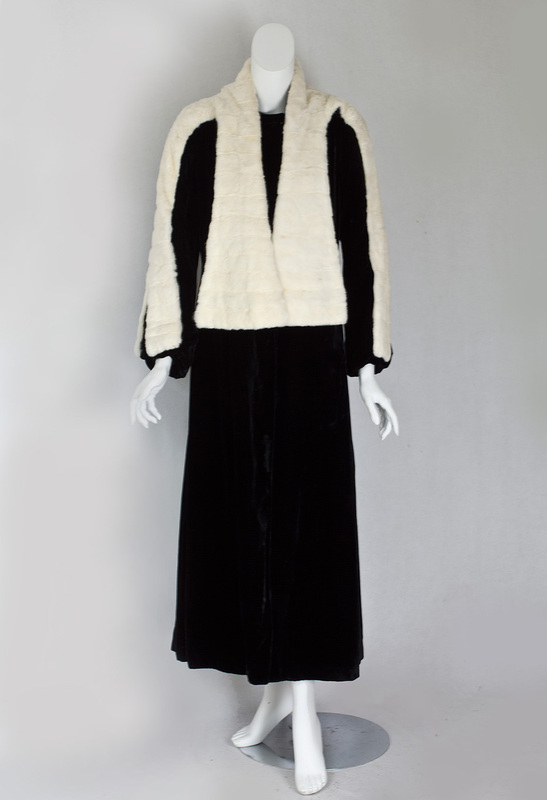 Made from black silk/rayon velvet, our chic coat pays homage to the heyday of Art Deco in the mid-1920s. 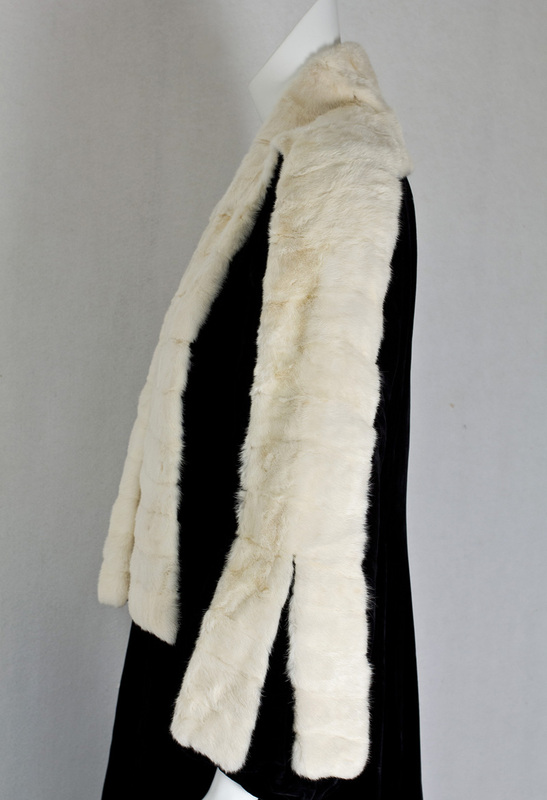 The draping of the white ermine is an inspired "architectural" riff on Deco geometric themes. 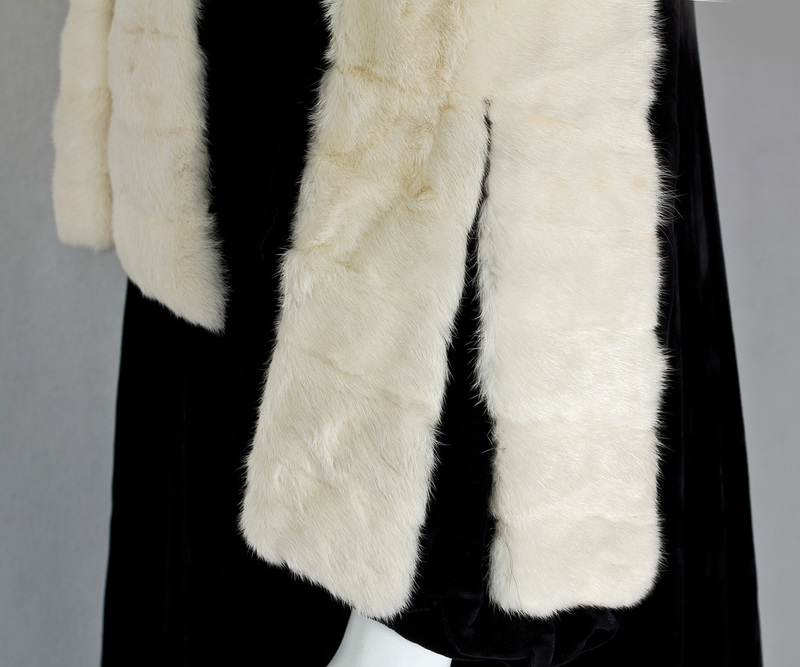 Here the white ermine fur creates a "framing effect" by delineating blocks of white and black in the dazzling Deco design. The champagne colored satin lining is backed with flannel, providing some winter warmth. 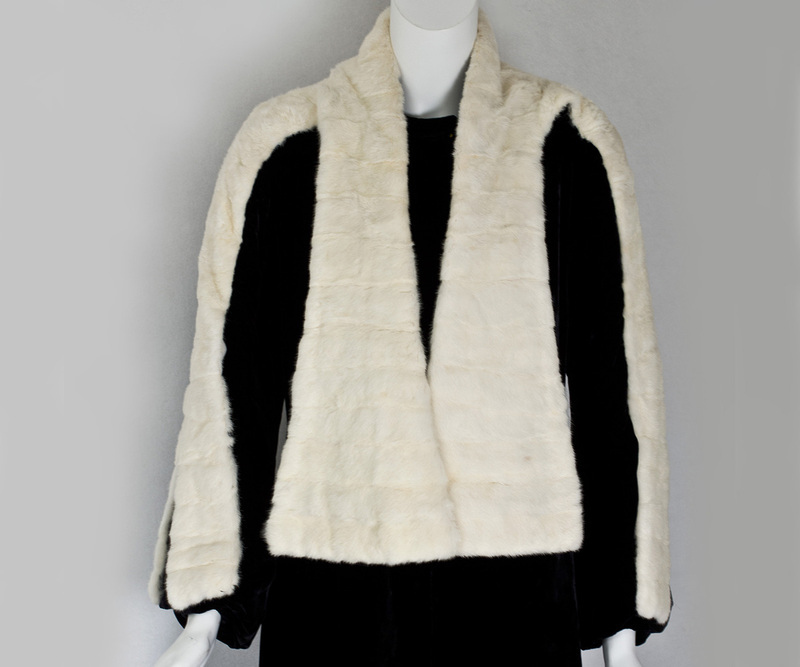 The sleeves and neckline are trimmed with white ermine fur, which is still soft and supple. 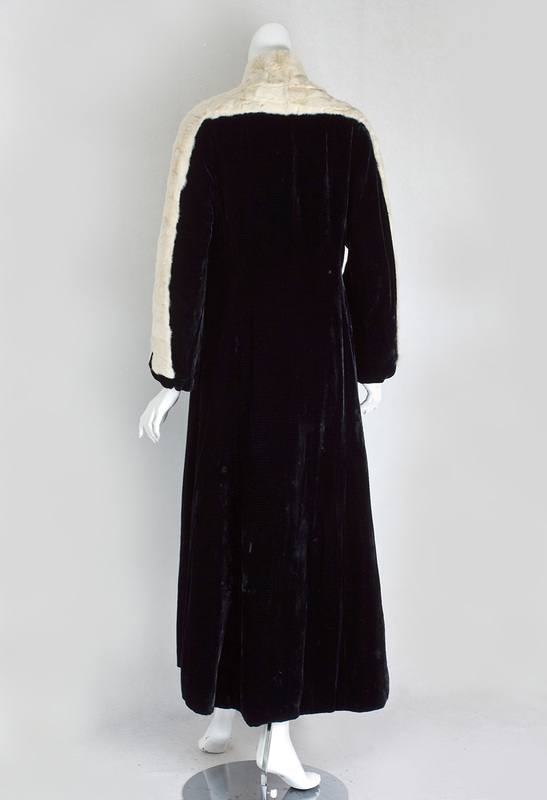 The coat closes at the neckline with a self-covered velvet button. In high style fashion, a white-on-black theme is perhaps the most dramatic of all. When done masterfully as in this quintessential 1930s look, the striking theatrical effect is truly memorable. 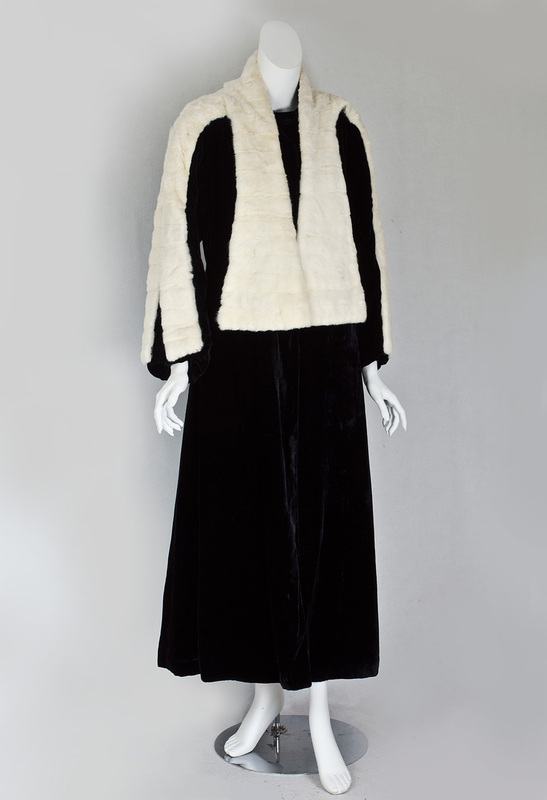 I half remember seeing movie femme fatale Holly Huntress in this coat at the Club Chimera on a chilly (for L.A.) evening in October, 1934. The spectacular Deco coat turned Holly into a Garbo as Holly made her grand entrance. Up close Holly's large, limpid, smoke-blue eyes had a mesmerizing effect. Plenty of guys had drowned in them. The style is slightly fitted at the waist and flared below. The full sleeves are cuffed at the wrist. The condition is almost excellent. There are a few small areas where the velvet pile is slightly crushed. It is barely noticeable. A good steaming should make most of this disappear. The exact measurements depend on the amount of overlap: approximately 40" bust, 38" waist, 44" hip, 24" sleeve length, and 54" from shoulder to hem.